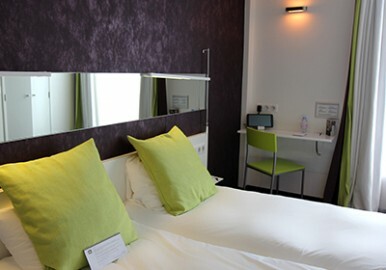 Best Western Hotel le Montparnasse 3 satrs Nearby is the Tour Eiffel, the Jardin du Luxembourg, the Rue de Rennes and many restaurants and shops where you can stroll at your leisure. Your 3 Star hotel in the heart of Paris. Located on the Boulevard du Montparnasse, just a short walk from the TGV (high-speed train) station and the legendary Saint Germain des Prés, within a district bursting with history, discover the Best Western Hotel Le Montparnasse! At the hotel, you can enjoy designer decoration and high-end services: individual air-conditioning, free Wifi throughout the hotel and in your room, soft quilts for a refreshing night’s sleep. You will also find those “little extras”: Kettle, 32″ LED TV and safe. The bathrooms have relaxing “rain” showers, handy hairdryers and anti-steam mirrors to save time. The hotel is a 5-minute walk from the Air France terminal, with direct links to the Roissy Charles de Gaulle and Orly airports. Nearby is the Tour Eiffel, the Jardin du Luxembourg, the Rue de Rennes and many restaurants and shops where you can stroll at your leisure. The team is on hand to make your stay as pleasant as possible and smooth your stopover at Paris. Get a taste of Parisian life and take full enjoy your stay in a district with great restaurants and shops. Book your buffet breakfast online and pay €9 instead of €12! With options "Early check-in" and "Express check-out"... more informations. A lift serves the 4 floors of the hotel. Unlimited and free Wi-Fi Internet access is available throughout the hotel. For your comfort, the hotel is equipped of air-conditioning. Between 7pm and 10.30pm. You will find a menu in your room. The train station Paris-Montparnasse is just few steps from the hotel. The hotel Le Montparnasse is 100% no-smoking hotel.